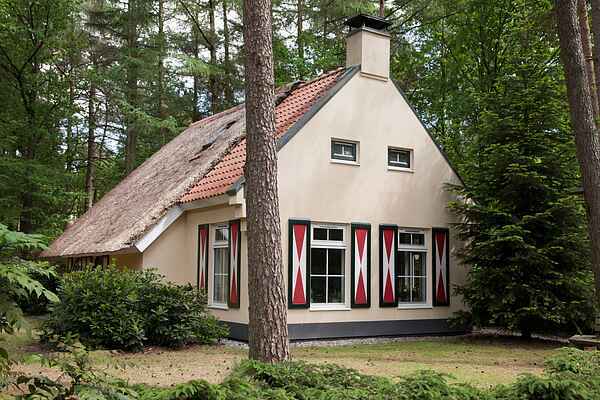 The detached 6-person (NL-7981-07, NL-7981-08 and NL-7981-17) and 4-person (NL-7981-10 and NL-7981-11) country houses were completed in 1999 and are situated on spacious parcels spread throughout the forested grounds. They offer the ambiance of times past, with the comforts of today. Many of the houses have a thatched roof. They are fully furnished in a charming style, some with a cosy wood-burning or traditional multi-fuel stove. Some houses have a sleeping alcove (perfect for children). Since the houses are privately owned, the furnishings vary from one to another. Pet-free country houses and country houses for respiratory patients are also available upon request. NL-7981-17 is a country house which has been adapted for people with limited mobility. These houses have a wheelchair-accessible lower level. There is an electrically adjustable recliner, a modified bathroom, and a bedroom on the ground floor with an electrically controlled adjustable-height single bed. All houses have a terrace with garden furniture.